I've always considered the phenomenon of the urinal in Amsterdam as an obvious sign that gender equality has not been achieved in this town. While the local government provides ample places to pee for men, hardly any public toilets are available for women. Strictly speaking, this gesture, which facilitates only half the population while the other half is explicitly, blatantly, excluded, cannot be called a public service. In fact, with all the current debates going on and decisions being taken by the national government and several major companies about gender neutrality, it is clear that the city of Amsterdam, which even fails to grasp the older concept of gender equality, is lagging behind. Whenever I come across one of those green ornamental iron 'curls' as they are called, I'm made acutely aware that I'm ignored and shut out on the basis of my gender, whether I actually need to pee at that moment or not. What is the municipality's reasoning behind this misogynist half-service? We all know that peeing is a necessity, for both men and women. So why are women and girls constantly told on the street that they don't need to pee, or, that, if they do, they can go do it somewhere else, that, in any case, their local government is not going to solve their problem while it does solve the problem for men? The subliminal message that women are given, in the public space of the city where they live, is that they simply, literally and quite physically, don't count. 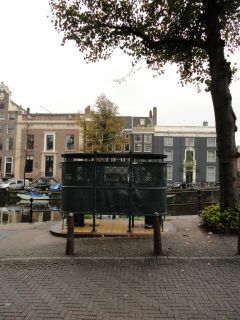 Recently a young woman was tried and fined for peeing in public near the Leidseplein. In itself, this was not a remarkable fact since it is illegal for both men and women to pee in public. The discussion the woman successfully raised was about the lack of an alternative space for her to urinate. She had urgently needed to pee late at night, all the bars and restaurants had been closed and there had been simply no place for her to relieve herself. Interestingly, the (male) judge suggested that with a little imagination she could have made use of a urinal. In other words, she should have tried to fit the male standard that is obviously not equipped to facilitate her bodily needs and habits. (Squatting in a shady corner in public is a lot easier for a woman that trying to pee standing up in a urinal). Most interesting about the judge's response to the woman's dilemma of where to pee, was his argument that there are less public toilets for women than for men - 'less' being an obvious euphemism: 35 toilets for men as opposed to 3 for women in the centre - because men are much more often found guilty of urinating in public. So, men committing the offence of peeing in public are rewarded with a municipal service, while women committing the same offence pay the fine and subsequently hold their water. The man's words were a precise reiteration of the phenomenon of the urinal itself. What they, the words of a judge, expressed to the young woman was: you don't count. With 35 urinals in the town centre and only 3 toilets, it really can no longer be the case that men urinate more often in public than women. I sincerely hope it isn't. For me, I know the pleasure of squatting and peeing behind a wall, a disused building or in the bushes at the edge of a park, knowing that by doing so I don't only relieve myself but also mark my territory like a dog: this is my city too you fuckers! I practise it regularly, and will keep doing so as long as I need to.